"THE BUTLER DID IT" — Mask & Mirror Community Theatre closes its eighth MainStage season with the mystery/parody "The Butler Did It" by Tim Kelly, May 3–19. Curtains: Fridays and Saturdays, 7:30 p.m.; Sundays, 2:30 p.m. at Calvin Church, 10445 S.W. Canterbury Lane, Tigard. Tickets are available at www.MaskandMirror.com for $15 adults and $12 seniors. Family friendly show is suitable for all ages. "A GRAND NIGHT FOR SINGING" — Broadway Rose, through April 28. Featuring the music of Richard Rodgers and Oscar Hammerstein. Featuring Caitlin Brooke, Joey Côté, Deborah Mae Hill, Kelly Sina and Joe Theissen. Curtains: 7:30 p.m., Thursdays-Saturdays; 2 p.m. Sundays. Also: 2 p.m., Saturday, April 6, 13, 20 and 27. New Stage, 12850 S.W. Grant Ave., Tigard. Tickets: $30 to $48 adults; $20 ages 6018; $25 ages 19-30; group discounts available. www.broadwayrose.org, or 503-620-5262. "TAKING STEPS" — Lakewood Theatre, Lakewood Center for the Arts, 368 S. State St., Lake Oswego. Curtains: Through April 7; Thursday, Friday and Saturday at 7:30 p.m.; Sunday matinee, 2 p.m., April 7. Tickets: $34 for adults and $32 for seniors. Other discounts available for students and groups. For additional information and tickets, call the Lakewood Box Office at (503) 635-3901 or order online at www.lakewood-center.org. over an under-painting of oil paint and metal spirit; Michael Fleming is a fused-glass artist. Reception: 11 a.m.-noon, Sunday, April 7. Gallery hours: Tuesdays-Fridays, 9 a.m.-4 p.m.; Sundays, 9 a.m.-noon. "HERE NOW: ART INSPIRED BY THE IMMIGRANT EXPERIENCE" — Arts Council of Lake Oswego, through April 5, 510 First St., Lake Oswego. Reception: 5-7 p.m., Friday, Feb. 15, free. Exhibition includes "Where Are You From? Exploring What Makes Us Oregonians," 6-7:30 p.m., Tuesday, Feb. 26, a conversation on the nature of communities. Gallery hours: 11 a.m.-4 p.m., Tuesdays-Fridays and by appointment. Information: artscouncillo.org, 503-675-3738. GOLDEN GALLERY —Beaverton Lodge, 12900 S.W. Ninth St., Beaverton. Featuring new paintings by Char Breshgold, through April. Gallery hours: Mondays-Saturdays, 9 a.m.–5 p.m. Information: 503-646-0635. ISING CHOIR — With the Westside Chamber Orchestra, hosting a celebration of Mozart, 7:30 p.m., Saturday, April 6; and 3 p.m., Sunday, April 7, St. Matthew Lutheran Church, 10390 S.W. Canyon Road, Beaverton. No tickets necessary and free of charge; donations accepted, with 100 percent donated to the Beaverton Arts Foundation campaign for the Patricia Reser Center for the Arts. Information: isingchoir.org/event. NATIVE AMERICAN FLUTE — Pacific University presents R. Carlos Nakai, the world's premier Native American flute performer, April 6 at 7:30 p.m. Nakai brings his award-winning music to the Pacific stage with percussionist Will Clipman at the Taylor-Meade Performing Arts Center, 2014 Cedar St., Forest Grove. $22.50 to $25. Visit pacific.edu/performing arts, 503-352-2918. NORDIA HOUSE —8800 S.W. Oleson Road, Portland. "Crossing the North Sea," an exploration of fiddle styles that developed as a result of the maritime trade routes between Norway, Shetland and points beyond. 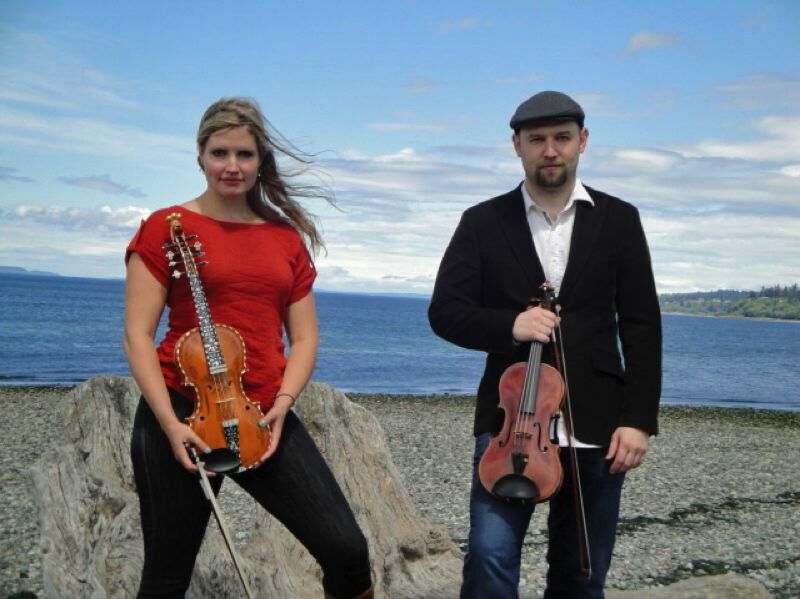 Featuring hardingfela (Norwegian fiddle) player Rachel Nesvig and Scottish fiddler Brandon Vance. Concert: 7:30 p.m., Thursday, April 25. Tickets: $20 members; $25 nonmembers, www.nordicnorthwest.org/0425191. BEAVERTON GARDEN CLUB annual plant sale, 9 a.m.-2 p.m., Saturday, April 27, St. Cecelia School parking lot, behind the church, SW Fifth & Franklin St., Beaverton. Hillsboro Brookwood Library, 2850 N.E. Brookwood Parkway. ANNIE BLOOM'S — 7834 S.W. Capitol Highway, Portland. • Kate Ristau presents "Morrigan's Revenge," the sequel to her Middle Grade debut, "Clockbreakers," 7 p.m., Tuesday, April 9. • Portland author and beer guru Jeff Alworth to read from "The Widmer Way: How Two Brothers Led Portland's Craft Beer Revolution," 7 p.m., Thursday, April 11. • Portland author Judy Nedry returns to Annie Bloom's for "Blackthorn," the latest in her Emma Golden Mystery Series, 7 p.m., Wednesday, April 17. • Author Valerie Brooks will read from her debut thriller, "Revenge in 3 Parts," 7 p.m., Thursday, April 25. POWELL'S BOOKS AT CEDAR HILLS CROSSING — 3415 S.W. Cedar Hills Blvd., Beaverton. • Westside Writing Group, 7 p.m., Thursday, April 4. • Author Katie Arnold will discuss her book "Running Home," 7 p.m., Friday, April 5. • Physicist and futurist Dr. Michio Kaku presents "The Future of Humanity," 7 p.m., Tuesday, April 9. • Science fiction book group, 7 p.m., Tuesday, April 9. Discussing "Just One Damned Thing After Another" by Jodi Taylor. • Booksigning for the Minecraft-inspired fantasy, "Escape to the Mesa," 7 p.m., Thursday, April 11. Note: This event is a booksigning only. A purchase of the book is required to join the signing line. • Deadly Diversions book group, 7 p.m., Thursday, April 11. Discussing Alan Bradley's "Flavia de Luce" mystery series. • The League of Exceptional Writers, 2 p.m., Saturday, April 13. This is a monthly workshop where authors and illustrators share knowledge with kids ages 8-18.